The Avengers International Fan Forum :: View topic - NZ Cinema Daybill Posters "THE AVENGERS"
NZ Cinema Daybill Posters "THE AVENGERS"
Posted: Sun May 04, 2014 2:39 am Post subject: NZ Cinema Daybill Posters "THE AVENGERS"
A pic of two of the Cinema Daybill Posters for AVENGERS episodes that were screened theatrically in New Zealand in the 1960s or 1970s. The theatrical screenings of the Avengers were one episode as part of a "double feature" often a comedy or a horror film. 2. The Avengers episodes were distributed by "16mm limited a division of photographic wholesalers ltd". Photographic Wholesalers was owned by Kerridge Odeon Ltd one of the two major cinema chains in NZ at the time. "16mm ltd" would also hire prints of full movies on 16mm for home movie buffs for quite reasonable fees, and they were liked a great deal by anybody who owned a 16mm projector. episodes would imply that the Avengers episodes would also be in 16mm ....they may have been 35mm prints (having worked in the NZ cinema industry in the 80s and 90s. 4. 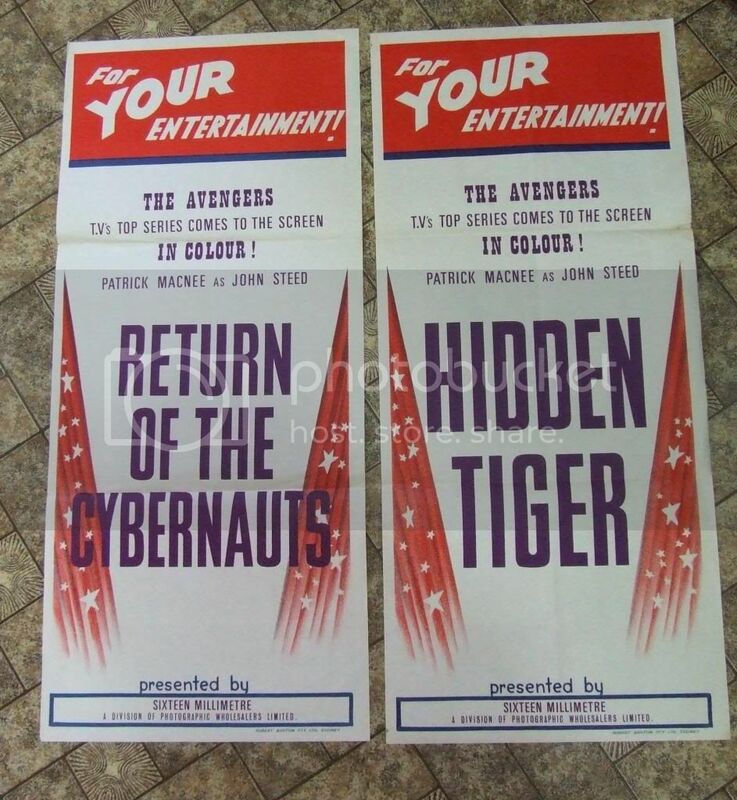 "16mm ltd" was still offering a couple of 16mm Avengers prints for hire in their rental catolougue in the 1980s , but they werent episodes that seem to have had cinema screenings in NZ. 5. Some of these may have screened theatrically after NZBC transmissions of season 5 on NZ television (which would have transmitted them in Black and white). (Possibly) FROME VENUS WITH LOVE. Fascinating, Denis! So before home video was really dreamed of, viewers could either see the Avengers in Colour at the cinema, or could buy 16mm copies for home use? Though I do recall in the UK at least that most movies for sale in 8mm or 16mm format were usually cut down, or "highlights", and sometimes even silent. Nice! 16mm was actually a pretty decent format. Did they have sound? There used to be a Canberra-based film company here in Australia called Reel Memories who sold episodes of The Avengers on film during the Eighties, among other shows. Early pirates, I guess but they might have had the proper rights. and later VHS.....btw, the posters....worth very much ? Was the show broadcast on new zealand television? If so by who and when? The first post clearly states that NZBC broadcast them.